And the coming months aren’t looking good, Dr Bettio added. “I’ve been in the water sector for 11 years; I’ve never seen a dam run dry and that’s the situation in Keepit,” he said. The pipeline to supply water to Broken Hill directly from the Murray, rather than the Menindee Lakes, got switched on last month. At least the more metropolitan areas of New South Wales are doing better — Sydney is sitting around 57 per cent of capacity and its desalination plant is up and running. Tests done by some of Mr Brill’s colleagues suggest that soils where phosphorus has built up over generations can comfortably handle phosphorus fertiliser being cut back by two-thirds. “I think it’s fairly important too that we still stick to the plans and to the rotation, so we don’t dig ourselves into a bigger hole for future years. “Just tonnes of soil being blown out to sea,” Mr Brill said. 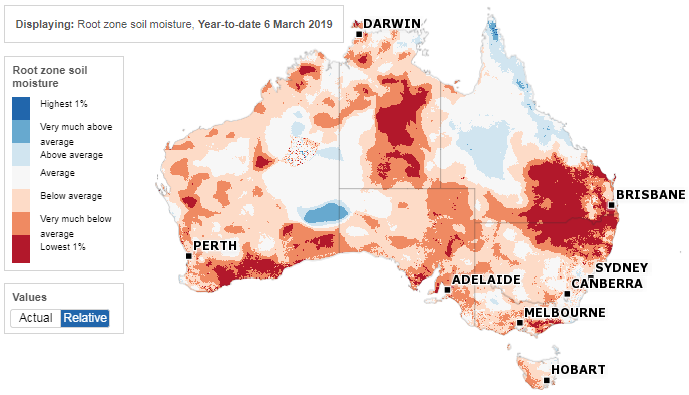 Originally published by the ABC, 12 March 2019.